ments for miscellaneous accessories. Gold color metal holder for wallet. turned pegs grip wallet firmly. Four roomy accessory sections. smaller ones. Brightly lined in luxurious red velour-like fabric. plastic partitions and richly lined with red velour-like fabric. Tiered dresser Caddy in handsomely grained oak with metal crest. support plush-lined gallery designed for glasses, wallets, etc. Crested Valet of walnut on black vinyl leatherette over wood. Opens to scoop tray for coins. etc. 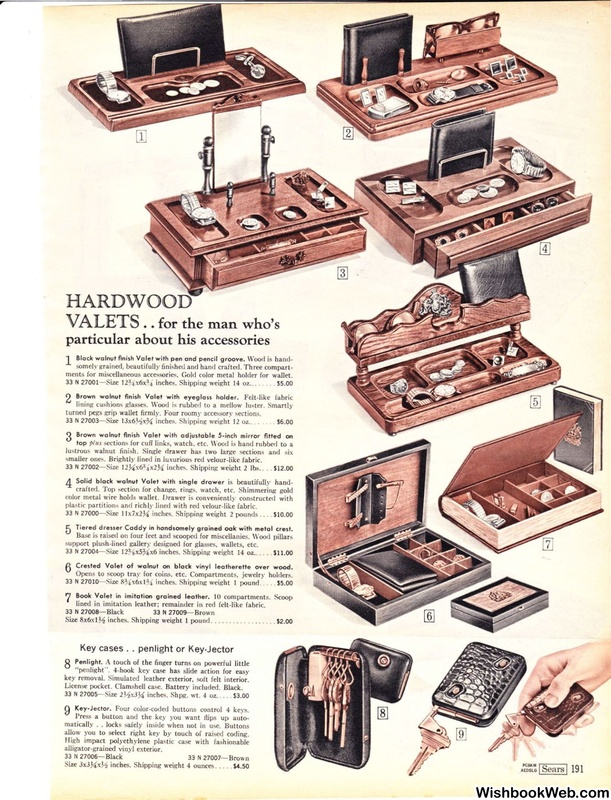 Compartments, jewelry holders. lined in imitation leather; remainder in red felt-like fabric . Size 8x6x1)4! inches. Shipping weight 1 pound . .
License pocket. Clamshell case. Battery included. Black. Key-Jector. Four color-coded buttons control 4 keys. allow you to select right key by touch of raised coding.